Pannier Tank 6430 has arrived at Buckfastleigh from the Llangollen Railway for the coming weekend’s Branchline Weekend and Real Ale Festival being staged over the three days. 6430 will be working auto trains along with sister locomotive 6412 which is due to arrive from the West Somerset Railway later in the week. Unlike 6412, 6430 has never worked on the Buckfastleigh Branch. It was purchased by the formative Dart Valley Railway from Cashmore’s scrapyard in 1965 but a shunting accident at the yard left it with twisted motion and other problems. Thus it was never seen as more than a source of spares. 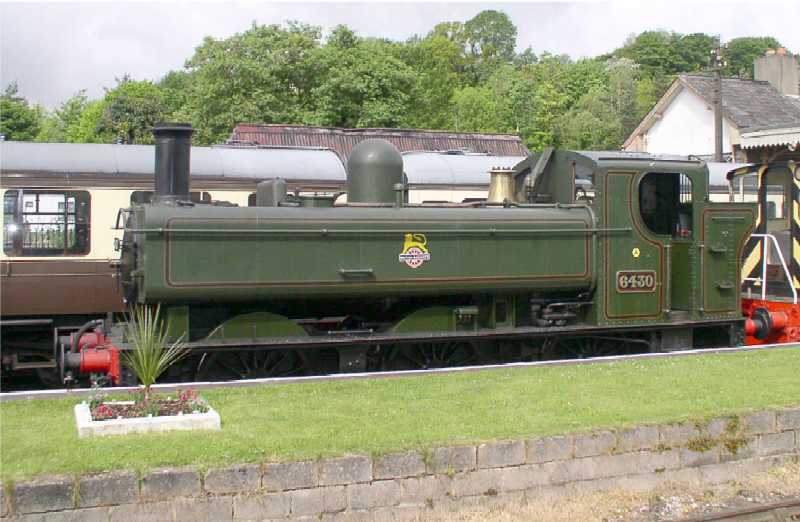 In the 1990’s Hugh Shipton bought the mortal remains from Dart Valley and took it to the Llangollen Railway where it has been transformed into a working engine. 6430 was a local engine in the early 1960’s when it was allocated to Laira shed in Plymouth. It famously became stranded in deep snow when working one of the last trains from Plymouth to Tavistock on the day the Launceston Branch closed - the day of the great blizzard at the end of December 1962. 6412 worked on the Buckfastleigh branch for several years after it was reopened by the DVR in 1965 but subsequently found itself transferred to the Paignton line where it was sold out of service as surplus to requirements in the mid-1970’s. It became famous as the “Flockton Flyer” in a children’s TV series filmed on the WSR around that time. The third preserved 64XX loco is 6435 which is one of the operational locomotives on the PDR. Note since this article was written in 2006 the PDR sold 6435 to the Bodmin & Wenford Railway Trust in July 2008. Loco 6412 has now arrived to complete the complement of locomotives for this weekend’s Gala Event. 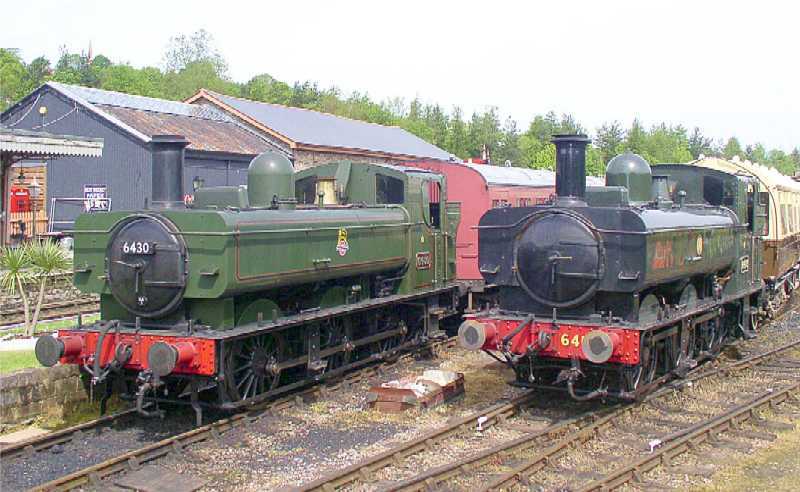 6430 and 6412 are seen posed side by side at Buckfastleigh this morning.